"The beginning of 2013 developed according to our expectations. Order intake grew by 22%, thanks to good development in both Power Plants and Ship Power, especially in the offshore segment. First quarter net sales and profitability were impacted by the anticipated low level of deliveries, mainly due to timing of projects. Interest in natural gas based power generation continued and Power Plants received significant orders from Jordan and USA. In Ship Power, the offshore and specialised vessel markets remained robust. Strategically important orders were received for exhaust gas cleaning systems, and for comprehensive solutions packages from the offshore industry. There is continued interest in service agreements in the marine industry, as evidenced by the maintenance agreement signed for ‘Viking Grace’, the largest passenger ferry ever to operate on liquefied natural gas. Supported by our solid order book and the stable Services business, our prospects for 2013 remain unchanged." Regulation on exhaust emissions in European waters and beyond poses challenges for fleet owners. The integration of Hamworthy’s expertise into the company’s portfolio has provided Wärtsilä with a significant edge in this area. This clear competitive advantage bore fruit in February with the advent of an order from the Korean shipyard STX Offshore & Shipbuilding. Wärtsilä was contracted to supply exhaust gas cleaning systems for four new Container Ro/Ro vessels being built for Ignazio Messina & Co, the Italy-based ship owner. 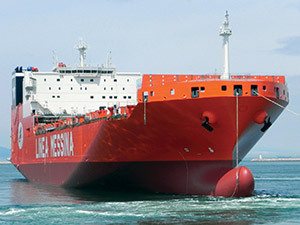 Messina already operates four Ro/Ro vessels, each equipped with five Wärtsilä Hamworthy exhaust gas cleaning units; this repeat order further enables their fleet to comply with both current and pending environmental legislation on exhaust emissions. For ships sailing in European waters, the maximum sulphur content will be limited to 0.5% from 2020, while a tighter limit of 0.1% will apply from 2015 to ships operating in ‘sulphur emission control areas’ (SECAs), which include the North Sea, the Baltic Sea and the English Channel.